The prospect of a warmer planet gives these findings broader application. In Europe, England sits atop the current wine belt, poised along with Germany for expanded viticulture as temperatures rise. In North America, major grape-growing regions extend along the West Coast from Southern California more or less to the Canadian border. So, warmer temperatures will improve the wine offerings of British Columbia. As the temperatures rise, the losers will likely be at the warm end of the viticulture scale—vineyards in Spain, southern France, southern Italy, and the Napa Valley. Hat tip: the dancing carpenter. 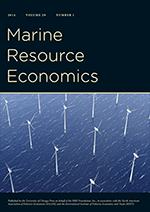 And don't miss the newest economics journal: the Journal of Wine Economics* (check out the movie review of Sideways, by environmental economist Rob Stavins), a perfect complement to the Journal of Cultural Economics. What's next, a Journal of Beer Economics to read alongside the Journal of Sports Economics? And yes, ladies and gentleman, I'll be here all week at the rowdy Running Bear Lounge. *Was everyone's introduction to wine economics that optimal control problem in Chiang's math econ book (i.e., when is the best time to sell the wine)? Or did I just date myself?